Hello again! It's been a long time hasn't it? I've missed you, I hope you've missed me too. It's been one month today since the last post.. Wow, I really need to get internet at the new place, badly! Things have started to calm down, and we're getting settled into our new home in Portland. It's different, but not in a bad way. Just need some time to adjust, and it'll all be good. After this move, we are really not interested in moving ever, EVER again. With that being said, I want you to go and make this pizza. Please and thank you! I was able to get two pieces OUT OF 16.. Thank you Jason and Scott. That's the only picture I could take after it was done. The boys ravished that poor, delicious, super tasty pizza. I am not exactly sure why I've been on a pizza kick lately. Probably because 1 - Jason loves pizza, who doesn't though? 2 - We both have been working really late, and A LOT and 3 - That's why. 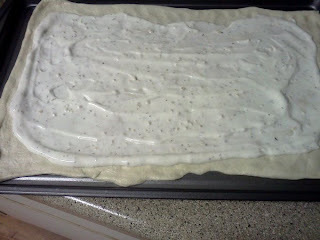 Oh and because I am in love with Pillsbury's ready to bake pizza crust. Yes, I can make my own pizza dough, but when we get home at 1030 at night, this bad boy comes in handy. 1 roll ready to bake pizza dough OR you can make your own. Preheat oven to 425 degrees. Whisk together all ingredients for the sauce, cover, and let chill until ready to use. Cook chicken and bacon as desired. Roll out dough to desired thickness, pour sauce over dough to about 1/2 inch from the edges of dough. 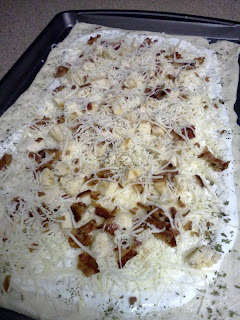 Sprinkle cheese and desired topping over sauce. 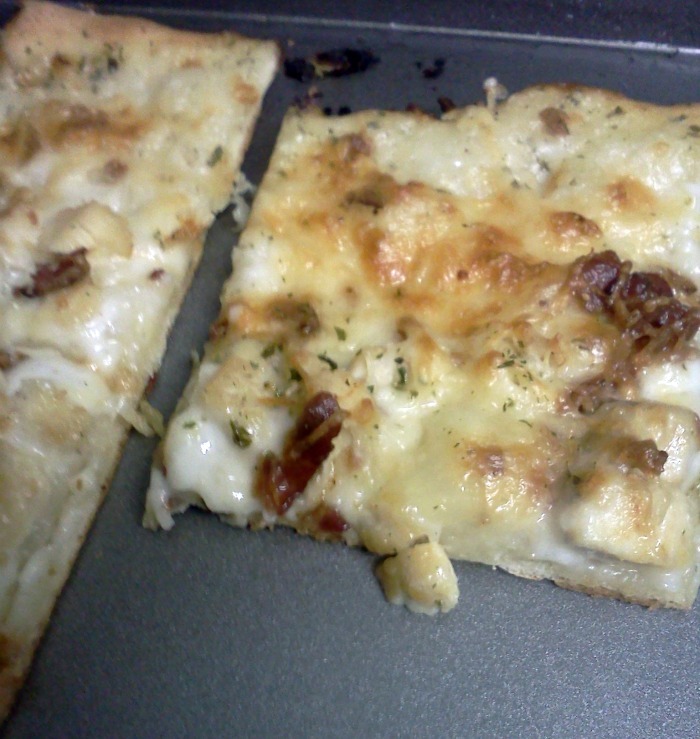 Sprinkle parsley over edges of pizza dough as well as the entire pizza. Bake 15 minutes or until cheese is melted and dough is nice and goldeny brown. I also did a Buffalo Chicken one the other night, it was good as well. I'll post that too!